The Deskstar™ 5K3000 hard drive provides an enormous 3TB capacity and features innovative CoolSpin technology to deliver a greater level of power efficiency and quiet operation for energy-conscious, environmentally-friendly computers. Key to CoolSpin technology is an optimization of motor speed to provide an ideal balance of performance, power utilization and acoustics. The CoolSpin technology, along with other Hitachi power management techniques, gives the Deskstar 5K3000 its 29% power savings over the Deskstar 7K3000. 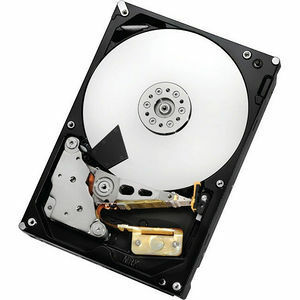 This new 3TB is the first Hitachi CoolSpin hard drive with a 6Gb/s SATA interface. With low power, high capacity and cool operation, the 3.5-inch Deskstar 5K3000 allows manufacturers to leverage the benefits of the latest components and operating systems to deliver more eco-friendly systems. Manufacturers planning to use the highest capacity 3TB drive in systems should consult the Hitachi High Capacity Technology Brief. CoolSpin and HiVERT technologies combine to create this new class of hard drive that delivers excellent power utilization and thermal emissions. HiVERT technology helps efficiently manage power consumption. These innovations, along with eighth-generation Advanced Power Management, make the Deskstar 5K3000 the ideal choice for energy-efficient PCs that run cooler, require less power and last longer. The Deskstar 5K3000 demonstrates Hitachi ecological leadership with its halogen-free design and power-efficient operation. Both of these features helped qualify the drive for the Hitachi EcoTrac classification, which identifies products that minimize environmental impact in the areas of product design, manufacturing, operation and disposal.